Welcome to Assassin’s Creed Week presented by Play the Past, where for a whole week, Play the Past will push content on the most popular historical video game series ever. Part I introduced the Week and asked why Assassin’s Creed mattered. Part II of the Assassin’s Creed Week series will look at how the series handles Race and Native relations. Note that the introduction originally had a different order but I decided to shift some things around. Recreating the past is not easy and must be done thoughtfully. In order to stay true to the era you are recreating, you must acknowledge the bad along with the good. For much of the Assassin’s Creed series, the games took place in periods that could be recreated without much chance of causing a controversy. This changed with the release of Assassin’s Creed III in 2012. Assassin’s Creed III was one of the weakest games in the series for a variety of reasons but those are going to be what is discussed today. Today’s post aims to look at how Native Relations and Slavery (specifically the Atlantic Slave Trade) are represented in the series. Assassin’s Creed III, was the first game in the series that introduced Native American relations and, by omission, Slavery into the series. This was continued in Assassin’s Creed III: Liberation, a Playstation Vita title that later was released for Playstation 3, Assassin’s Creed IV: Black Flag, and the now standalone DLC pack for Black Flag, Freedom Cry. Assassin’s Creed III introduced a brand new era, location and protagonist for the first time since Ezio Auditore debuted in Assassin’s Creed II. 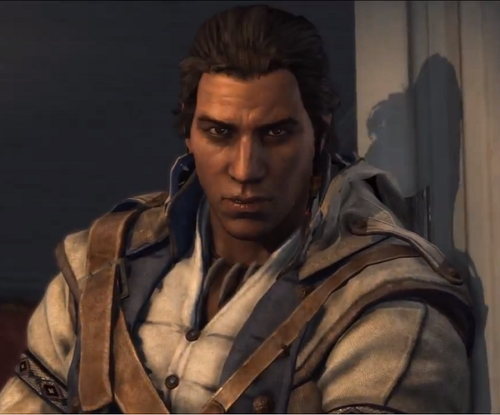 This new protagonist was Ratonhnhaké:ton, or known by his English name, Connor Kenway. A Mohawk man, Connor’s initial goal in his quest to become an Assassin is to protect his homeland from those who might destroy it or harm his people. In his quest to help his people, he becomes aligned with the Sons of Liberty and ends up helping the colonists in the Revolutionary War. The story is not as black and white as that outline portrays it but is a pretty good way of summing up everything. This caused some controversy in the media, as some claimed (at least in the Canadian media) that a Native American would have never fought for the Colonialists in the Revolutionary War and claimed that Assassin’s Creed III distorted history. However, this is a load of crap. First, many experts have expressed that Natives fought on both sides of the conflict and to restrict an entire group to one ideal is offensive in itself. Secondly, while Connor does aid the Colonists in their struggle, he is mostly an outside observer that only gets involved when it suits his own needs (assassination of Templars). Trying to accurately portray Mohawk traditions and customs was a bold goal and so the Ubisoft Montreal team turned to an expert. Thomas Deer from the Kahnawake Language and Cultural Centre, was a permanent advisor for the development team for almost six months. Reportedly, after being consulted Ubisoft removed scalping as a gameplay feature as the Mohawk did not participate in that practice. The game was generally praised for its portrayal of the culture without shoving Connor’s heritage down your throat. Connor was realistic and also happened to be Mohawk, which was really enjoyable. The reviews amongst the Native community were largely positive as well. This is all to say that Assassin’s Creed III took a risk by trying to portray Natives but succeeded by being informed and going in depth. Ubisoft should be commended for this because Native American’s (among other minorities) are largely underrepresented as leads in popular video games. Native relations were well preserved in Assassin’s Creed III, which is why it was so strange that the game ignored slavery almost entirely. 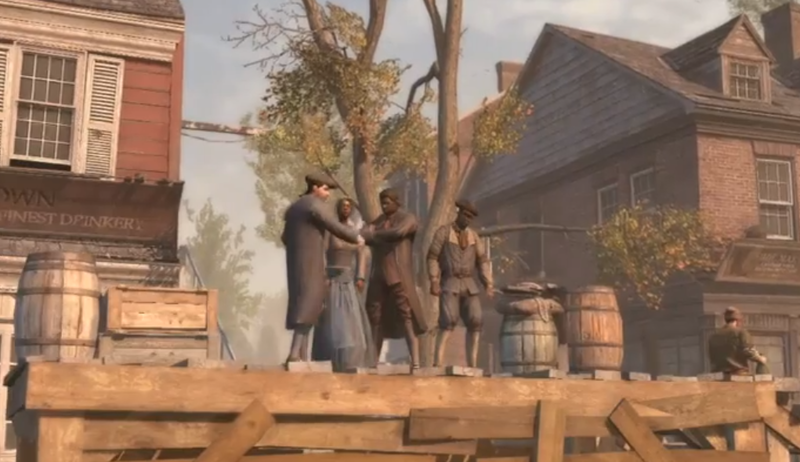 There are only a few mentions of the Atlantic Slave Trade in the story of Assassin’s Creed III. The two most prominent times are when Connor confronts Samuel Adams on his ownership of slaves and again during the epilogue when Connor watches from afar as slaves are sold near the port in New York. Beyond this, Connor and his mentor Achilles (an African-American) discuss the latter’s difficulties dealing with society. The game does make mention to what became a vile and cruel part of America’s history but as a player it felt glossed over. That is not to say that slavery needed to be a major theme in the game but it still felt like it did not go deep enough when addressing slavery in Revolutionary America. While slavery gets swept under the rug a bit in Assassin’s Creed III, it has been a major theme in every other game released since then. Released at the same time as Assassin’s Creed III was Assassin’s Creed III: Liberation, a Playstation Vita title. Liberation takes place in Louisiana near the end of the French and Indian War. The protagonist in Liberation is Aveline de Grandpré, a French and African woman. The game did not shy away from slavery but rather included it in much of story. Aveline meets her Assassin mentor after being captured by slavers and later helps bring down an entire slave trade network run by Templars. Having a female protagonist was a big step in the series (but more on that later) but so too was making Aveline African and connected to the slave trade. Edward: Did it rub you wrong when I took this Brig as my own. Adéwalé: It was the sort of rub I have learned to endure sailing among faces of such… fairness. Edward: It’s true, most of these men wouldn’t accept you as a captain. So what fair role would complement such unfairness. Adéwalé: I’ll be your quartermaster. Nothing less. The limitations behind being African and a former slave are recognized here and are referred to during the story. Blackbeard and Hornigold are slow to trust Adéwalé when they first meet him. These moments are not frequent but not so small as to be forgotten. These points in the game serve to remind the player about the conditions that even freed slaves had to endure. 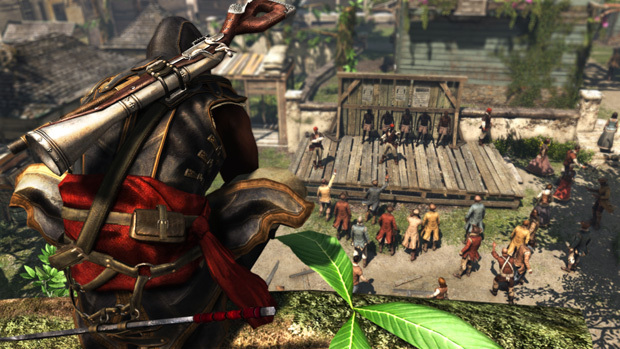 The latest Assassin’s Creed content released is the Black Flag DLC, Freedom Cry. 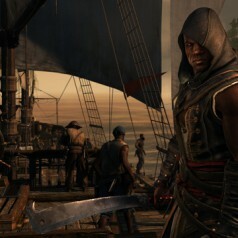 The playable character is Adéwalé for this short campaign and takes place fifteen years after the end of Black Flag, primarily set in Port-au-Prince. In this shorter Assassin’s Creed adventure, slavery is the main theme. Adéwalé must free slaves and recruit Maroon warriors fighting in order to unlock missions, perks and items. Slave auctions, plantations, and slaves ships are events where Adéwalé can free a large number of slaves. On a smaller scale, he can save runaway slaves as they escape a chasing slavemaster who will shoot them dead if Adéwalé does not intervene. The player is put face to face with the horrors of slavery. The way that native relations and slavery are handled in Assassin’s Creed is very impressive. Ubisoft Montreal actively includes content for gamers that does not hide how the treatment of Native Americans and African slaves was deplorable. Games can often times fail at representing this properly as is seen in a pair of Play the Past’s most popular posts. Trevor Owens wrote a pair of posts about Sid Meier’s Colonization in regards to these very topics. Colonization whitewashes history by not including slavery he argues in his first post and then in the follow up looks at how the Native’s are de-peopled by not being included as playable characters. These posts were obviously the inspiration to this post and a good example at how with the right direction, video games can take serious and delicate topics and represent them properly. Video games can be a serious and mature media, it just needs developers that are willing to try. Tomorrow’s Assassin’s Creed Week post is on how women are portrayed.